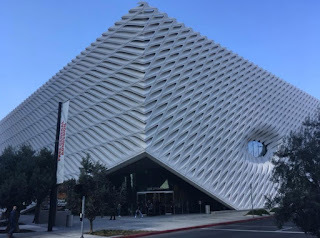 As mentioned previously, my son’s celebration of my birthday included tickets to the new Broad museum in Los Angeles which I have read a lot about but never seen. Frankly, it was not at the top of my “must see list” since contemporary art is not my field of interest and there are so many other museums to see in LA. I learned yet again, try everything, you never know! Eli Broad bought his first real estate at age 20 and co-founded home builder Kaufman & Broad in 1957 with $25,000 borrowed from his in-laws. Thanks to the Baby Boom, KB Homes became a tremendous success in affordable housing. The Broads built up their art collection over a half century and gave it an appropriate setting in a Frank Gehry-designed building on their Brentwood Estate. While others say that one has to wait half a century to see if the art stands up, the Broads believed that to build a proper collection you had to collect while the paint was still wet! Like most patrons they knew what they liked and knew what they wanted so, according to Eli Broad, he had trouble getting along on museum boards and I am sure they felt the same way about him! The Broads switched their patronage from one institution to another in L.A. and in the first decade of this century they decided that the Los Angeles County Museum (LACMA) needed a building devoted to contemporary art. They collected only the “Best” artists work and that included, architects, so they asked Renzo Piano to build a three-story edifice on the LACMA campus which opened in 2008. The Broad Contemporary Art Museum at LACMA has 60,000 square feet of galleries and rotating contemporary art exhibitions. It was assumed that their collection would follow but that was not to be. No sooner had they finished the LAMA project, they started to think about their own museum for their personal collection. The Broads decided again on star museum architects, this time Diller Scofidio & Renfro, to build their two-floor 120,000 square foot space. Half is devoted to gallery space and the rest houses the Broad Art Foundation’s worldwide lending library which for almost, 35 years has been lending works of art out to museums. Titled simply “The Broad”, their museum opened in September of 2015 and has had about 2,500,000 visitors to date. Thank goodness Hunter had pre-ordered the timed tickets or we would not have gotten in. I must admit that the space is very impressive. The galleries are huge have the advantage of 16-foot movable partitions that are up to the the challenge of a flexible presentation of the large-scale art that is the taste today. 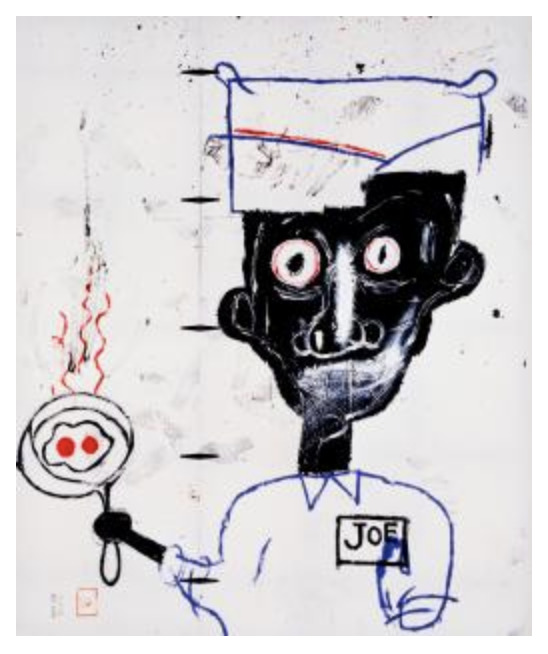 The Broads believe in collecting in depth so on their museum website I found 14 paintings by Jean-Michel Basquiat. 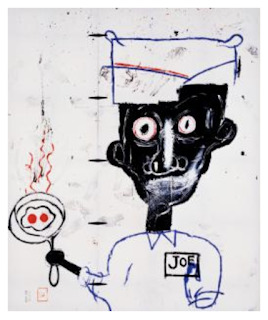 When we were there “Eyes and Eggs”, a 9.9 x 8.1, foot painting from 1983 was on view. What might look a bit cartoonish in an illustration certainly is impressive when you are directly confronted by it in the museum. Devoting a room to a single artist does make an impact especially if you already have some interest in him or her - it also gives you an opportunity to change or modify your opinion. Unfortunately, if you do not feel positive about the artist’s work in the first place it can also solidify your original thoughts. 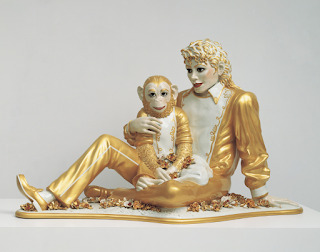 I have been fascinated by Jeff Koons who is one of the hottest artists around. Why?, because I have heard he is a collector of old master paintings and sculpture which I have handled for over half a century and I know it takes a certain sophisticated and educated taste. Then why does Koons make oversized balloon like sculpture and this “Michael Jackson and Bubbles” (1988)? Seeing at the presentation of Koons’ work at the Broad did not provide an answer. 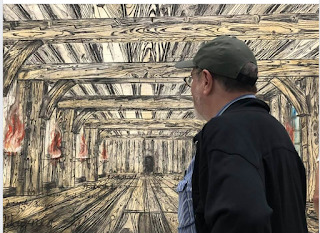 One room that blew my mind had an oversized painting, to say the least, over 10 x 20 feet by one of my very favorite contemporary artists, Anselm Kiefer. Some years ago, I spent over 3 hours with a friend in the Kiefer exhibition at the Grand Palais in Paris. The Broad painting takes up a whole wall and totally envelopes you. I felt that I could get lost in the picture! The painting is called “Deutschlands Geisteshelden” (1973) (Germany’s Spiritual Heroes). The Broad explains that Kiefer positions the viewer at ”the mouth of a great hall” which includes aspects of the artist’s former studio and a known German hunting Lodge used to store looted art by the Nazis. You see no art but on the walls the names of German Artists that had figured in this painful chapter of history. Clearly his sympathies are with the artists. Here is an image of the painting and yours truly immersed in it. If you are interested in art and go to museums, you never know what you will find. There will be works you’ll like and those you won’t, but if you don’t make the venture, you will never know. 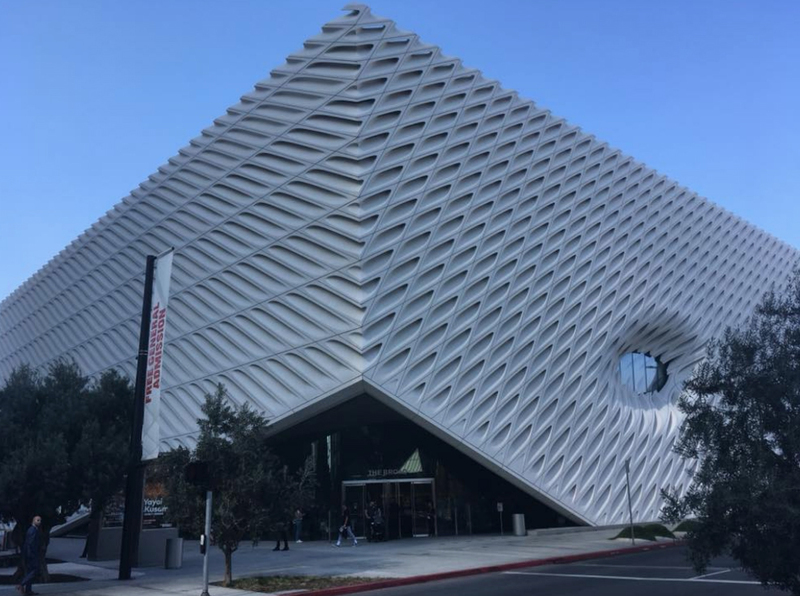 I found the Broad definitely worth the visit. 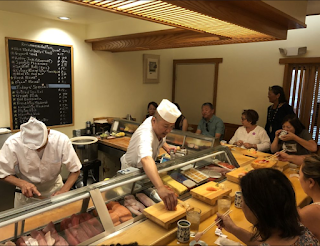 It so happened that my birthday fell during my stay in Los Angeles, and my son, Hunter, knowing that I love Sushi took me to Little Tokyo where on the second floor of a department store complex was a Sushi bar that was absolutely fabulous. 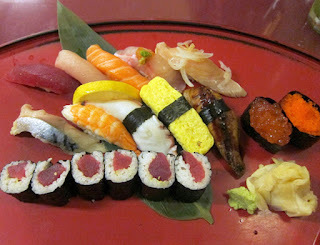 All the chefs and staff were Japanese as were most of the patrons. Should you be in L.A. it is called Sushigo55. It was the real thing right down to the location, herewith photos of the latter, the restaurant and the beautiful tasting food. As we were leaving by a different entrance than we came in from, in front of us was The Japanese American National Museum, a museum that was new to me. Of course, I asked Hunter if we could go. Lunch had been such a perfect setup. Hunter had another museum surprise for me later in the afternoon, but we had time. It is a wide open space with several exhibitions going at once, including one on Japanese toys and another on the photographer Kip Fulbeck who has been photographing persons who identify as “hapa”, from the Hawaiin meaning half, part or mixed, that are of Asian/pacific islander decent. His 15-year project promotes awareness and positive acceptance of multicultural identity. The exhibition that interested me most was “Common Ground: The Heart of a Community”. Back East we were aware of the prejudice and injustices done to African Americans. In the Southwest it is the Native Americans and Hispanics who have been given the short end of the stick. Having just finished the book “Hawaii” by James Michener, I have learned far more about the prejudices of the white population against the Chinese, Japanese and others brought in as indentured servants. This went on well into the 20th century, with the fear that if Hawaii became a state the whites would be ruled by the Japanese, particularly as they were going into business with the Chinese. “Common Ground” showed hundreds of objects, documents and photographs collected by the museum covering 130 years of the Japanese in America. Truth be known, it was a specific period, and the one that was covered the best, that grabbed my attention, the persecution of the Japanese during World War II. From their second generation on, Japanese in the U.S. felt as American as anyone else. I, the son of German Jews, felt I was American, and said so loudly from the age of 3. The prejudice and alienation experienced by Japanese Americans , however, is difficult to fathom. In the exhibition is this poster. 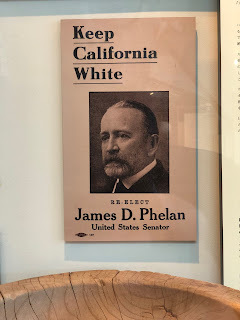 It shows a man running for his second term in the US. 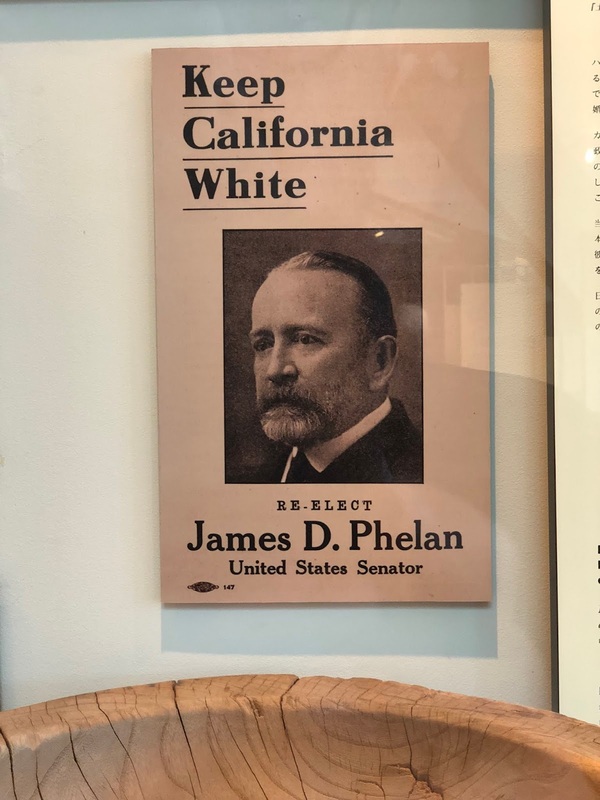 Senate in 1920 saying, “Keep California White”. At the dawn of World War II young Japanese Americans understood that they had to prove their patriotism, but they were not allowed to join the armed forces. Anglos felt they were all probably spies or Japan sympathizers. In Hawaii, however, nearly 40% of the population was Japanese American and if they had been incarcerated it would have crippled the local economy. So instead they declared martial law and continuously harassed the community. With Executive Order 9066, signed by President Franklin D. Roosevelt 10 weeks after the bombing of Pearl Harbor on December 7 1941, the way was cleared for the eventual internment of 120,000 Japanese, well over half being U.S. citizens. By 1943,however, they were allowed to form a regiment and fight in Italy, France and Germany. That was the 442nd Infantry Regiment out of Hawaii. The 442nd is the most decorated unit in the history of American warfare with 9,486 purple hearts, 8 Presidential Unit Citations and 21 Medals of Honor! These were some of the thoughts going through my head as I walked around the show. But there was so much I did not know. For instance, that there was a large Japanese community in the state of Utah brought in to fill railroad construction gangs in the early 20th century. Remember, going West was our “manifest destiny”. Out of Utah’s total population of 373,000 thousand in 1910, 2,110 were Japanese. 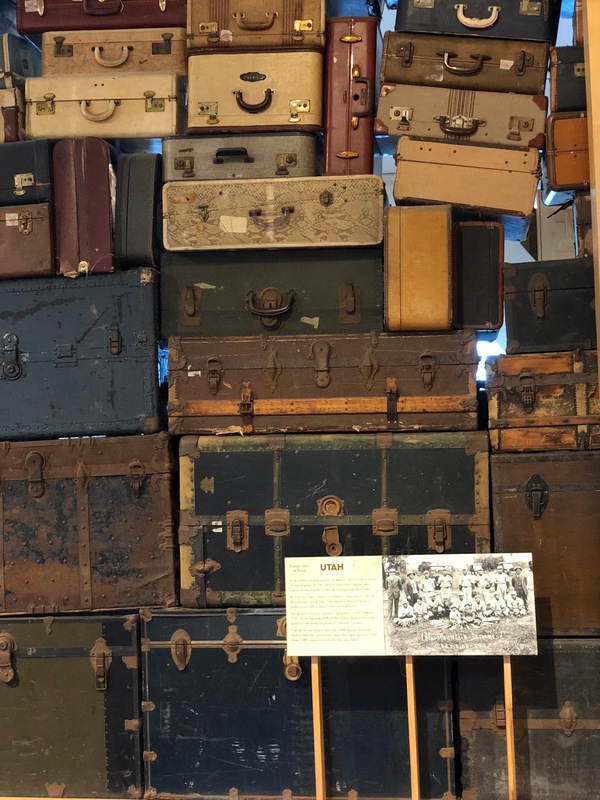 This had grown to 8,000 when the Japanese internment camp called Topaz opened in 1942. Here you see their piled up suitcases. They were only allowed one each. 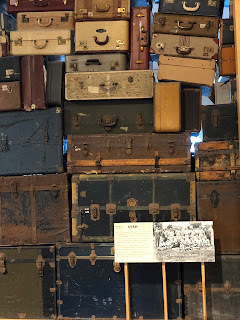 The exhibition has an original internment barracks It is from the Heart Mountain Relocation Center where more that 10,000 Japanese American, rounded up from the entire West Coast, were incarcerated. This barracks is 20 x 16 feet and was intended for a family of 2 or 3, or more bachelors. Around it were labels with quotes. From a former inmate, George Iseri, “The most important thing I brought was my baseball mitt and shoes. Only one suitcase. Oh, yes I remember”. And from a visitor, Bacon Sakani “ … by taking a person inside that barrack [s], you can explain what happened to us better. Just talking about it is not enough”. This latter is a good thing for all teachers to remember. 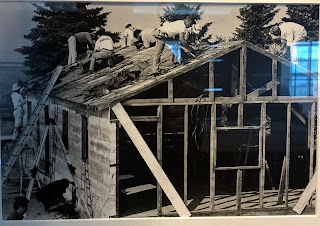 Here is an image of building a barrack and one of the barracks in the museum. 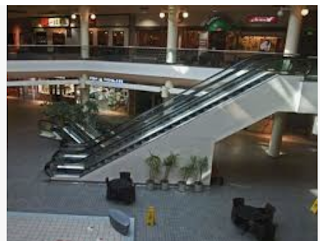 We so often forget and have to be reminded that when citizens everywhere get scared and feel threatened they close down and fear all foreigners. After my conference in Los Angeles I was free to visit museums and, being already in the neighborhood, I went over to The Getty Center. In my young professional life the Getty Villa that now just houses the Antiquities’ Collection was the entire museum. Since J. Paul Getty (known simply as Paul Getty) had not been back to the States since 1952 he never even saw the Villa which was completed in 1974! In the early 1970’s I remember one curator who said that Getty was so tight with his fortune that she had to buy her own pencils! But when Getty died in 1976 at the age of 83, it was a whole new ball game. He left between 600 and 700 million dollars including 12% of Getty Oil stock to the institution. This already made the Getty the richest museum in the country. 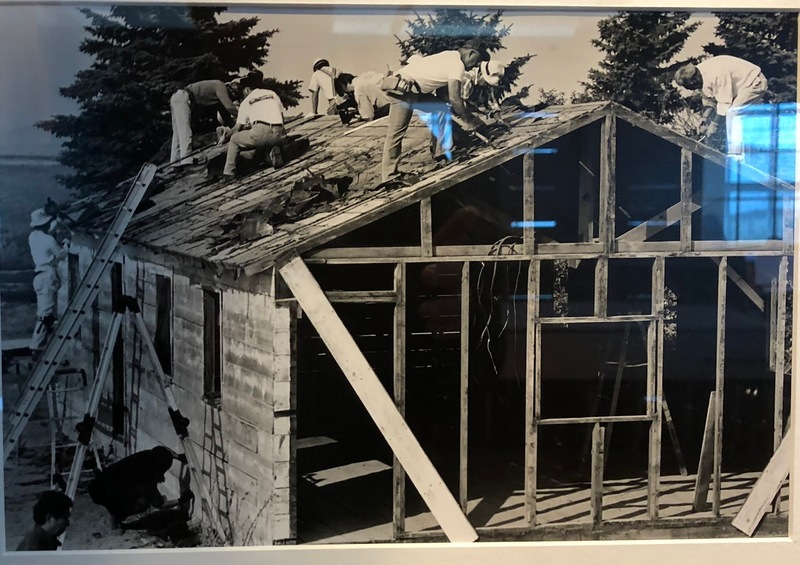 After years of legal fights between Getty’s heirs, and a dirty takeover fight in which Texaco finally won, the Getty became worth twice as much. Today, it has an endowment of over 6 billion dollars! Money causes its own problems and the Trust must by law spend a percentage of its worth every year. It therefore had to expand rapidly, adding a conservation institute and research institute, as well as other entities. At one time they wasted their time and money trying to come up with a universal vocabulary for art. One example: would a French 18th century chest of drawers be called a ‘commode’ (the French word) by all art historians or something else! The expenditure everyone has seen one way or another is the Getty Center building atop a hill in Brentwood (part of L.A.). The architect, an award winning one, of course, was Richard Meier and the museum complex opened in 1997 at a cost of about one billion dollars. I don’t mind saying I initially hated the architecture and wasn’t a fan of the architect personally either. 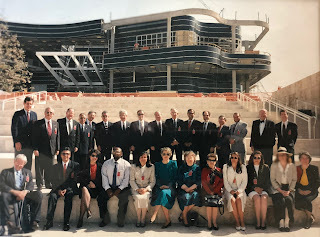 My first visit was shortly before the Getty Center opened and I was there with the President’s Cultural Property Committee out of Washington D. C. Here we are on the plaza with a number of arts ministers from Central America who were more interested in what money they could get out of the Getty Trust than speaking to us about Cultural Property issues. Time passes, and a couple of decades down the road and I must admit it is an oasis, a kind of art “never, never land”. After the tram ride up the hillside and steps to climb (there is an elevator) you arrive at a large entry hall and then emerge onto the main plaza a complex called Buildings 1-4 or North, South, East and West. I still got lost there but you can regain your bearings by following the art which is divided by periods and subject matter. It is all very dramatic and makes the Getty a definite destination. Personally, I come for the art and that is stupendous too. Here a partial view of the plaza. 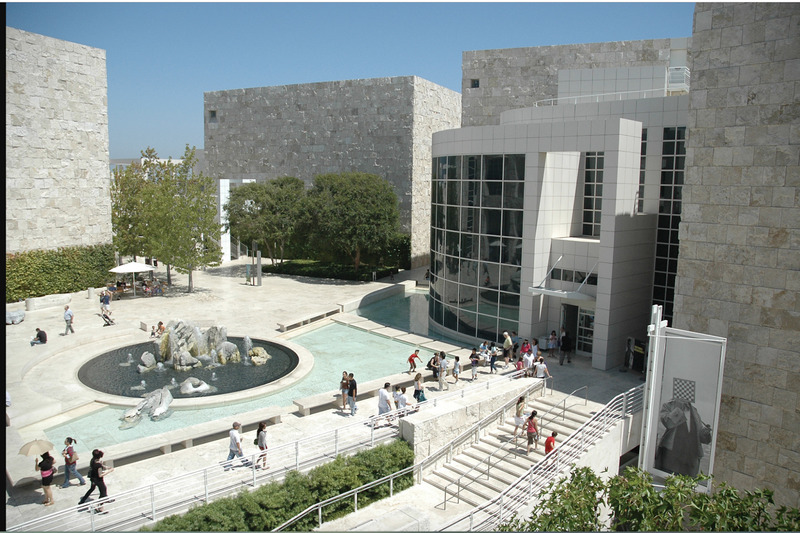 In the 1990’s there was a large influx of great curators that the Getty culled from museums around the country. If you couldn’t find your favorite curator at your local museum, he or she had probably moved to the Getty. It paid off. Getty was a passionate collector in the fields of Antiquities and French 18th Century Decorative Arts but not so much in Old Master paintings, one of the areas that the museum has developed since. The first director of the “New” Getty swore they would never collect photography until they bought their first marvelous collection thanks to a curator who came from the Metropolitan Museum. I had not been at the Getty for a very long time but knew the core collection, so I focused on newer acquisitions. A good friend and one of the few from my active years who is still there, Charissa Bremer-David, Curator of Sculpture & Decorative Arts, insisted that I see the newly acquired Rothschild Pentateuch, which means literally "five books” in Greek, referring to what we call the Old Testament. It includes some of the bible’s most famous stories and some or the oldest codes of law, with of course, the Ten Commandments. It belonged to the French/German Baroness Adelaide Rothchild who donated it to the State Library in Frankfurt am Main. In 1950 it became part of an exchange for real estate between the German Government and a German-Jewish family that had relocated to New York. In other words, a family that had lost its property because of Hitler accepted the manuscript as part payment for the loss. Then the Getty acquired it…. such is the strange life of objects. It is shown in a room with other Getty Manuscripts. The book was open to the Menorah of the Tabernacle, a page from Leviticus. This was part of a single gallery exhibition called. Art of Three Faiths showing examples of the Torah, The Bible and the Qur’an. I am, however, just going to show my favorite image among these Getty manuscripts which comes right out of my teenage fantasy. It is part of a secular manuscript done in Augsburg around 1560-70. The book in which this appears would have been created for the occasion of a joust, illustrating the participants, their armor and heraldry. I have always admired 17th century German Ivory Carving and in the Getty galleries I came across this covered goblet with mythological scenes created by one of the best artists of this technique, Balthasar Griessmann, when he was about 60 years old, around 1680. Here, the procession honors Bacchus, Roman god of wine. All the gods represented in this piece are so magnificently carved that you want to touch them… guess that is why the museum keeps them out of reach in a case! Further along I discovered a small painting acquired just last year. It is by Francesco Mazzola, known as Parmigianino, (1503-1540). This image of the Virgin and Child with St. John the Baptist and Mary Magdalene, dating 1535-40, is clearly meant as a private devotional work. Most unusually, the painting was done in oil on 7 sheets of paper which were then laid down on a panel. The technique and the incredibly well-preserved condition gives an immediacy that jumps out at you. “Tell us about J. Paul Getty” is the visitors’ most frequent request, Charissa told me over a lovely lunch in the museum’s nicest dining room. So, after all these years, they have established a small area for an audio-visual display where you can read articles and listen to snippets about Paul Getty’s life. It took me back to my own experiences of the man, and to the manor house in England where he proudly showed me the model of the original villa where small models of the works of art acquired were placed. For me revisiting the Getty Center was surprisingly rewarding, seeing great art in a contemporary environment in the company of an old friend and memories of Getty himself.